It’s that time of year again. WordPress provides an annual report for all the blogs. Below you will see mine. It is amazing to me. Last year I got about 75,000 hits, but this year the numbers increased to around 260,000. People in 169 countries have visited the blog. Isn’t that incredible. I don’t know the total number of countries in the world, but I think it is around 195. When I started the blog, I had no idea that it would grow like it has. I am so thankful for the blog followers. I believe the blog has grown thanks to the followers spreading the word. You folks are the best! 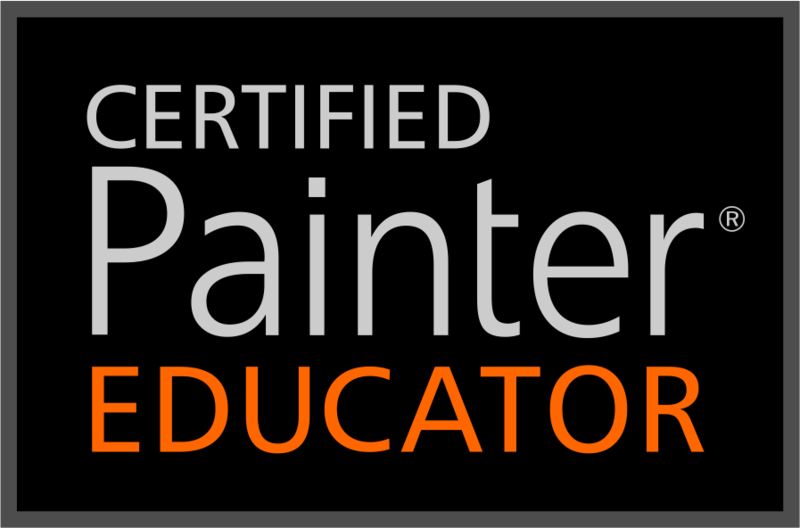 I want to send a special thanks to Corel Master Painter Karen Bonaker. Her blog, The Art of Karen Bonaker, referred many folks to my blog. As a matter of fact, of all the referrers, she ranks in second place. Thank you so much Karen. Take a look at the report. The map is a little hard to read; the countries that are darkest blue generated the most hits. Lighter blue indicates fewer. There has been only one visitor for 10 or so countries and another 10 have two hits. Those will be almost white. Regardless of the color, the blog has had visitors from 169 countries. I know I said that in the first paragraph. Guess what? I’m going to say it again. Folks in 169 countries visited Skip Allen Paints. I’m sorry, but that just blows my mind. Thanks everyone for making my 2012 a fabulous year. And thanks WordPress for preparing the year-end report. Those who are new to the blog may not have met Kevin, the resident “good” computer virus. According to Kevin, a good virus is sort of like the good witch in the Wizard of Oz. I’m not so sure. With a snort, he said, “No need now…you blurted it out already!” And with that he turned and vanished. I think I really hurt his feelings this time. I’ll make up later. Happy New Year!!! I hope you all have the best New Year ever. I enjoy making decorative paintings, and this impasto painting of roses is a good example. To do the painting I had to make a few brushes. I want to make a brush that works like a palette knife, and I think I am pretty close. Here is the painting that I recently finished. I like a lot about this painting, but I still need to tweak the brushes a bit more. But, before we talk about the brushes, I want to demo something that folks have requested. Notice the canvas texture in the painting; that is what I want to discuss first. I have shown this technique before in the Tips and Tricks Webinar, but I do not think many saw it. So, I am going to explain it again in this post. Incidentally, I learned this technique from David Gell at Jitter Brush, his website. To create the texture, we need to make a pattern from a paper. David supplies a wonderful brush that aids in the process…Pattern Pens Plus > WYSIWYG Paper Extractor. Do go to his site and get the Pattern Pens Brushes. To start the process, we have to make a pattern from a paper. Not just any pattern, but a seamless pattern. Then the pattern can fill a layer. We will add a layer mask, fill it with black so the pattern will not show. Then with an opaque brush filled with white paint, we will reveal some of the pattern. It seems so simple, and it is. Here are four videos that will take you through the process. I am unsure why the videos are not showing, but click the link takes you to You Tube to view the video. I apologize for any inconvenience this causes. I’ve tried to figure this out for a couple of hours. Rather than continue, I am going to post as is. Hopefully, they will show up correctly later. UPDATE: I figure it out. For some reason the link was posting correctly to the visual tab of the blog, but not so in the Text part. So I deleted the garbage in the Text part and recopied the links and presto…the videos appeared. That’s it for creating paper from a pattern. I hope you enjoyed them and learned something useful.But there is more. I have made some new brushes that helped me accomplish the Rose painting. I thought it might be interesting to show you the raw brushes and how I used them. I show a few brushes that are available for download, now. I hope you enjoy these videos. My dear friend, Corel Master Painter Karen Bonaker, has made and posted for free a new set of must have brushes. Karen is a top-notch brush maker and you are going to love these. Here is an image that she posted on her blog showing the variants at work. Do yourself a favor and follow the link. Then you will want to sign up to follow her blog. The link will bring you to the first post in a series of 25 posts. Each one will describe one of the brushes in the set via a video. I love the brush described on the second day. Ho Ho Ho! 25 Days of Christmas Tree Brushes for Painter 12. You are going to love these brushes. Check them out and enjoy painting with them. Karen, thanks bunches for offering these wonderful brushes!